I love soup. Whether they be thin, flavorful broths or thick, hearty chunky soups, they’re all very welcome on our dining table. Despite the veritable parade of various soups on our table, there’s one soup that holds a place of honor, having been passed down from one of my great aunts to her daughter and nieces. This chunky, flavorful soup possesses an equally venerable name: Great Wall. I have no idea if the soup is Chinese in origin. It might even be known by some other name, but that’s the name we grew up with so that’s what I’ll call it. A chunky, smooth soup, Great Wall is loaded with corn kernels, bits of ham, shredded chicken and cubes of soft tofu. Giving it a pleasantly light creaminess is the fact that it begins as a roux. The corn adds an interesting crunch, just as the tofu softly breaks apart on your tongue. The ham and chicken add both texture and flavor to this pleasant medley of tastes. I’ve been trying to get the recipe, but I get lost in the dictation process. I think the best way to approach it will be to try learning to cook it myself, then figuring out a recipe. It’s quite obvious how much I love this soup, isn’t it? 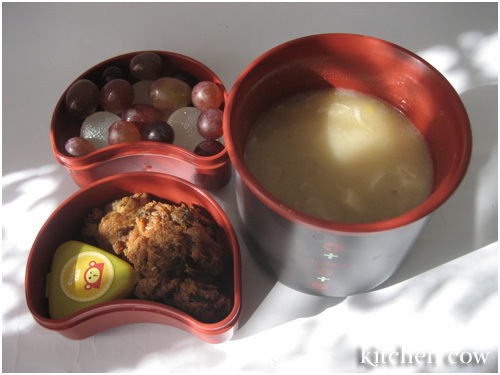 Still, to complete the meal, I decided to add some salmon balls and sauce, lychee jelly cups and grapes. hope you can provide the recipe…. Glad you’re finding it useful Gaye 😀 Don’t worry, I’ll write a recipe up as soon as I can pester my mom to teach me. This sounds delectable. I hope you do come up with a recipe!